Easy, refreshing 2-ingredient Coconut Water and Fresh Berry Popsicles made with strawberries, blueberries, and raspberries. They’re for July 4th, but also great all summer long! Gluten free, dairy free. 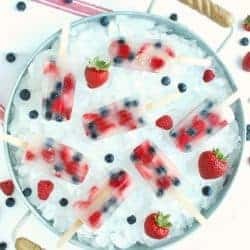 With July fourth coming up, I’m excited to share these easy, healthy, and super festive Coconut Water and Fresh Berry Popsicles with you! Plus, I’ll tell you how to pick the best coconut water (including my top 3 favorite brands), and which ones to avoid! 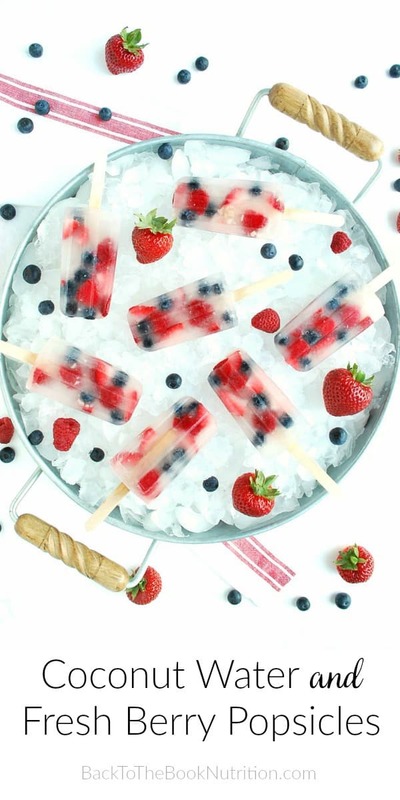 But July fourth calls for something red, white, and blue, so today it’s coconut water popsicles with fresh strawberries, blueberries, and raspberries! 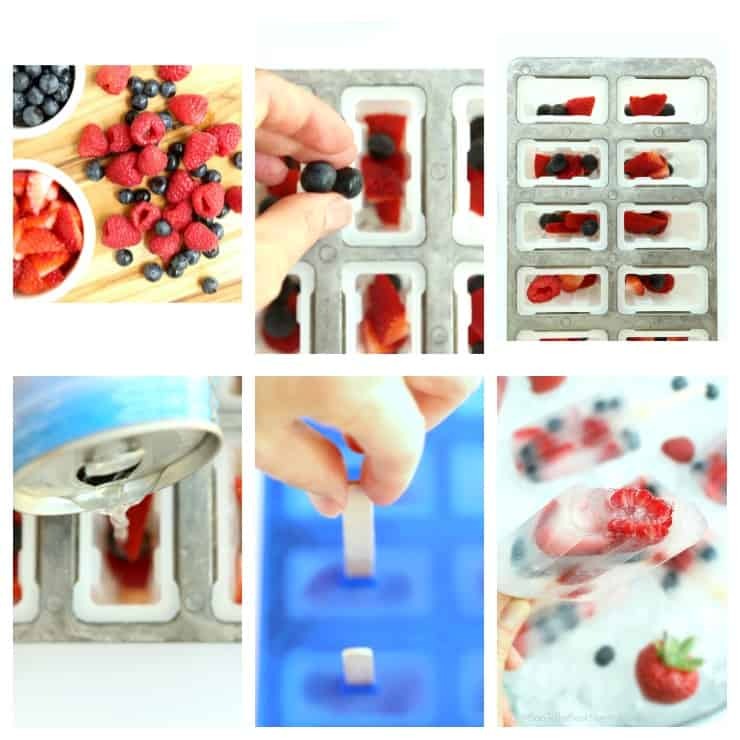 These couldn’t be any easier – just drop some berries into popsicle molds, then fill with coconut water and freeze. A few hours later, they’ll be the hit of the July 4th party. No one needs to know they took virtually zero effort! Coconut water has been touted as a healthy substitute for Gatorade and soda. It’s true that pure coconut water is a good source of electrolytes like sodium and potassium, and has a refreshing flavor. As a result, tons of coconut waters have flooded the market, some even sold by soda manufacturers like Pepsi and Coca Cola (How’s that for irony?). Not surprisingly, the most popular brands of coconut water have added sugars and flavors on the ingredients list, and often use GMO coconuts. coconut water from concentrate, water, cane sugar, coconut cream (coconut extract, water), cocoa processed with alkali, natural flavors, carrageenan, gellan gum. “Pure” coconut water with sugar, natural flavor, and carrageenan – really? What happened to simply collecting something wonderful from God’s creation and enjoying all of its natural benefits without adding other junk to it? Well, the good news is, some companies are doing just that. 100% raw, unpasteurized coconut water from non-GMO, USDA certified organic coconuts. No added sugars or flavors. Buy Harmless Harvest Coconut Water here. 100% coconut water from non-GMO coconuts. No added sugars or flavors, and they offer “with pulp” (I used this one for my popsicles) or “pulp free” versions. It’s also one of the cheapest and is carried by both health food stores and regular grocery stores. Buy Amy & Brian Coconut Water here. 100% coconut water from non-GMO coconuts. No added sugars or flavors and pasteurized at low temperatures for only a couple of seconds. Buy Harvest Bay coconut water here. Of course, even better than packaged coconut water would be drinking it straight from the coconut! Learn how to open a coconut to get coconut water, using nothing more than a paring knife! 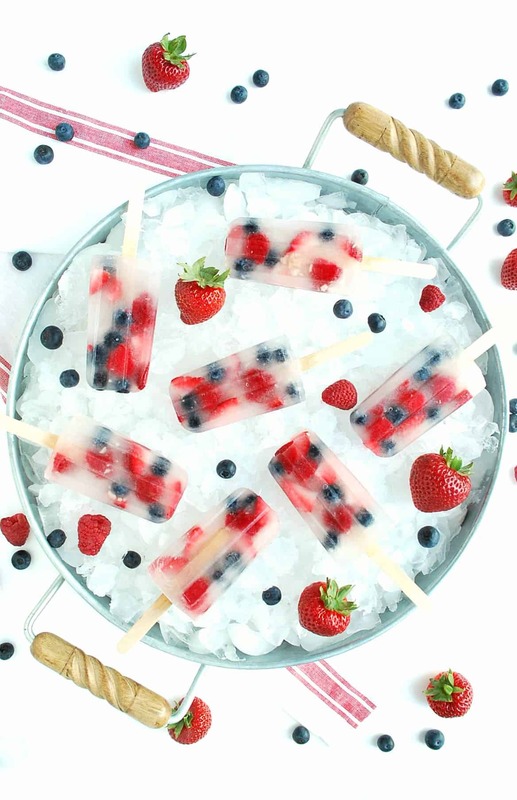 Whether store bought or straight from a fresh coconut, coconut water and fresh berries make the perfect pair in these super refreshing and naturally sweet Independence Day popsicles! Drop beries into popsicle molds (smaller pieces will go to the bottom, others will have to be gently nudged into the mold using a butter knife or extra popsicle stick). Thanks for this recipe and sharing the 411 on coconut water. I did try some recently myself, and it really took some time for me to get used to it. Perhaps the trick is adding fruit flavouring or using it as part of a smoothie base. I am excited to try this! Do the berries stay spread out when it freezes? How easy, refreshing and festive! I love that you used coconut water , I would’ve never thought of that. These look so good and refreshing, a great alternative to ice cream in summer ) Going to try this one with my kids. Thanks for sharing! You’re right – such a light and refreshing treat. I hope your kids love them! This is such a beautiful popsicle! I love both berries and coconut water, so it’s something that I’m going to make soon. Thank you, Tina – enjoy! Thanks for all the information on choosing a coconut water! What a beautiful treat for a celebration–or for any summer day! You’re welcome, Elaine! Thanks for reading and for your comment! What a fabulous looking treat. Wow, those look beautiful and like they would taste so good! Must try! This just looks so good. Love the inclusion of Coconut rather than some other flavour. Looking forward to giving this a go. These look very pretty as well as delicious! I love fruit and coconut water, I need to buy some lolly moulds. Thanks for your comment, Thea. Enjoy the popsicles! Mmmm this sounds good and easy to make – we don’t have the same coconut water brands in Norway, but I’m pretty sure I can find som that work, I’m a huge fan of natural coco water! Yes, I love that coconut water is everywhere now! Omg, this one is a winner. I would love to tey making this. My kids would love this. 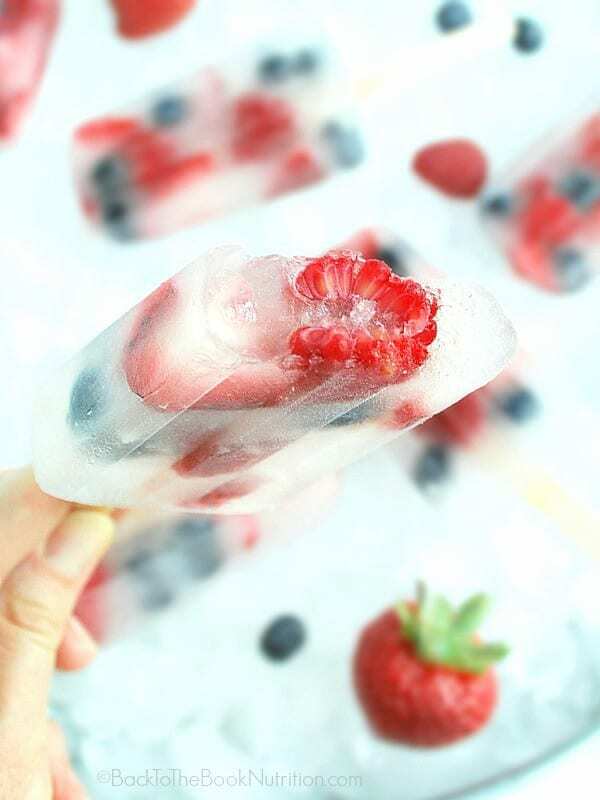 That coconut water and fresh berries popsicles recipes looks so delicious and refreshing and the procedure looks so easy to follow. My kids and I will definitely make this on weekends. What a delicious and refreshing recipe! Thanks for sharing your top brands with us as well. It can be so hard to determine what is worthwhile and what is just good marketing. These are so pretty! They look so tasty but I am one of those who can’t do coconut water! Bummer, Heather! Well, these could also be made with plain water or water with a squeeze of lemon or lime – I think either would work well! I do love homemade popsicles. The berry and coconut combo intrigues me. Healthy, tasty, and a good way to stay hydrated in the summer heat. These is such a cute and colorful popsicles. I like how fresh fruits are added so it add in more texture when biting it. Great for summer season and my family would love it. Yes, the fresh fruit adds such a fun texture! Ooh…these look super delicious. I totally want to try them out. I love homemade popsicles. I’d never tried this before. Great idea! I never thought of coconut water with berries – this could be a great treats for my nieces. Thanks for your comment, Eliza! It really is such a simple recipe and kids love them!